"We are not the best because we are the oldest, we are the oldest because we are the best." The Decker Family has spent over 63 years enhancing and refining the growing and processing procedure to make what we feel is the most natural form of fruit manufacturing. The combination of soil and weather in the fertile Tualatin Valley produces quality fruit, such as is found nowhere else in the world. With advances in technology and innovative techniques, we move our fruit from the fields to the freezer within hours to retain the firmness, flavor and color for the most discriminating user. Whether for foreign or domestic uses, Decker Farms is dedicated to perfection and proud to produce the quality expected and the reputation we uphold! 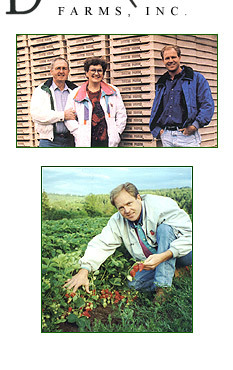 "We at Decker Farms have been offering our customers premium quality, value and service since 1946. Season after season, we upgrade our harvesting and processing equipment to give our customers the very best products. With the help of quality-conscious employees, Decker Farms is able to control all aspects of processing, from the soil in the fields, through quality inspections, to final packaging - bringing you the finest products on the market."